To those in the know, the health of the commercial real estate submarket can indicate as much about the health of the industry sectors that are located within it as the Dow Jones industrial average or the Nasdaq. When Peter Farrell formed ResMed (NYSE: RMD) in 1989, he had his sights set on delivering a groundbreaking treatment for sleep apnea sufferers. The academic-turned entrepreneur has not only pioneered this niche technology, but his company has made some serious cash along the way. Investment levels are on the rise across the nation -- albeit slow -- reflecting a steady trend for venture capitalists. Amidst political unrest and an uncertain economy, investors and entrepreneurs alike have experienced a tentative environment in recent quarters. Vince Lombardi once said, "The will to win is not nearly as important as the will to prepare to win." He wasn't talking about raising venture capital, but he might as well have been. Attracting smart capital requires preparation and a well-conceived game plan. The quest starts long before you ever talk to a VC. Preventing disclosure of sensitive information regarding a company's intellectual property and technology portfolio is often a major focus of many companies. Indeed, a significant amount of time and legal fees are often spent making sure that third-parties cannot access information that is critical to many companies' success. An e-mail protection service, an organizational psychology scoring system and a company developing a prosthetic vertebral disc product will pitch themselves and compete for a $10,000 cash prize in front of approximately 300 members of San Diego's venture community at the fifth annual PitchFest Dinner and VC Auction, co-hosted by the San Diego Venture Group (SDVG) and the San Diego Telecom Council (SDTC) Tuesday, Oct. 26, 5:30 p.m. at the Hyatt Regency La Jolla. Sales increases, hiring increases and significant research and development (R&D) investment all support the conclusion that San Diego can claim the title of the "Wireless Capital of the World," based on the findings of a survey of the San Diego telecommunications industry. When Kevin Anderson was hired to help biotech vet Karl Y. Hostetler find money to launch a San Diego startup called Chimerix in early 2001, nobody was remotely interested in funding the development of a smallpox drug. The timing was off -- capital markets were in the midst of a downturn, following an over exuberant and over funded dot-com frenzy-turned collapse. The solution for funding had to be found elsewhere. I have been frequently asked, "What is an angel investor and how do angels fit into the financial and business evolution of a company?" Since 1988, the UCSD CONNECT MIP Awards program has served as a benchmark for predicting the region's most successful emerging technologies. The past few years of a weak investment climate led many software entrepreneurs to opt for slower growth and wait for more favorable market conditions before entering the venture capital foray. Leading indicators show that 2004 may be the year. Entrepreneurs wear many different hats when starting a new venture. The protection of their physical assets, revenue stream and intellectual capital is paramount to success. San Diego's venture capital history is more anecdotal than recorded fact. By 2002, major telecom companies had virtually slashed their capital improvement budgets, making it almost impossible for fledgling startups to find cash. Despite the industry's financial setbacks, telecom executive Fernando Corona decided to make the leap to a San Diego-based wireless startup called V-Enable. Like any industry, venture capital has its own language. When trying to raise money for startup or later stage ventures, it is helpful to have a working knowledge of the industry lingo -- both the true definitions and the more "between the lines" definitions. Here again by popular demand, The San Diego Venture Group presents a tongue-in-cheek "Venture Terminology Dictionary." Securing outside private equity investment may appear daunting to the first-time entrepreneur. Make no mistake -- it is, and should be so. Angel investors and venture capital firms do not part with their money lightly. Innovators need to take concerted steps to successfully attract outside capital for their new venture. The Southern California investment climate is no different from the rest of the country, and funding opportunities lie fewer and farther between than in years' past. Nevertheless, companies can still close financing deals if they go after the prospects intelligently. When a startup company raises money from a venture capitalist, the most common approach is to do a preferred stock financing. It is important for technology innovators to understand that putting together an initial funding strategy will require several critical paths. The following are some ideas that are typically worth pursuing, however entrepreneurs will probably have to tap more than one of these sources to yield a credible plan. Most of us who call this city home recognize the innovative and collaborative spirit that makes our city so vibrant. 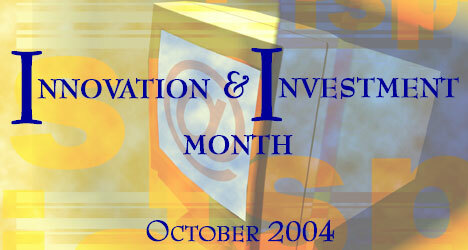 One prime example is the San Diego Innovation and Investment Month campaign. This campaign marks the second year of collaboration between the San Diego Software Industry Council, the San Diego Venture Group, the San Diego Regional Technology Alliance, the San Diego Telecom Council and UCSD Connect to celebrate and promote the entrepreneurial and investment-related events slated to take place in the region between Sept. 28 and Oct. 27.